4000QE - is a great electric hot water pressure washer capable of tackling any agriculture, construction and industrial heavy-duty application. 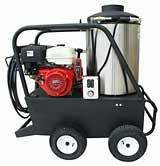 It is available in single and three phase voltage and it produces 4000 PSI and 4 GPM. This unit has a quick-change tip that allows spraying angles of 0°, 15°, 25°, and 40 degrees. 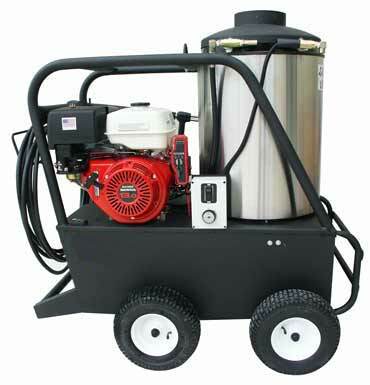 This is an industrial rated pressure washer equipped with a triplex plunger pump with ceramic plungers and stainless steel valves, thermal relief valve, chemical injection, 40’ hose, schedule 80 coil with stainless cold wrap, rust free poly burner fuel tank, powder coated frame with hose/wand rack, and adjustable thermostat and pressure pop-off. If you tend to use it indoors, make sure the machine is properly vented.